The Commission is working hard to preserve and restore our state capitol. While the past two capitol commissions were entrusted with the construction and decoration of the capitol, the present commission is dedicated to ensuring it is restored and preserved for the next generation of Missourians. As our statehouse approaches 100 years of operation, the Missouri State Capitol Commission (MSCC) continues to highlight the building’s artistic and historical significance through outreach and education. A continuing area of concern to the Commission is the deteriorating condition of the capitol’s substructure, exterior façade, and internal mechanical systems. The MSCC actively supports funding for such infrastructure repairs, and our state’s leaders have likewise recognized these critical needs. The passage and approval of House Bill 19 in 2013 was a significant step forward in initiating large-scale restoration efforts. Although budget shortfalls have restricted the implementation of several key provisions of this legislation, efforts to secure funding for repairs are ongoing and will be on the agenda for the upcoming legislative session. Educating key stakeholders, including members of the general assembly, local community leaders, and media outlets continues to be a priority. Along these lines, the MSCC has coordinated with the Office of Administration Division of Facilities Management, Design and Construction to facilitate “behind the scenes” tours of the basement and catacomb areas. Allowing guided access to otherwise restricted areas has proven to be an effective advocacy tool. Following the passage of Senate Bill 480 in 2009, the Commission’s duties were expanded to commemorate the 100th anniversary of the laying of the building’s capstone. Planning efforts for this upcoming milestone (December 5, 2016), as well as other major dates in the capitol’s construction, including the centennial of the laying of the cornerstone (June 24, 2015) and dedication (October 6, 2024) are currently underway. MSCC is collaborating with the Department of Natural Resources, the Office of Administration, the Missouri State Archives and other entities to utilize these key dates to raise public awareness of the significance of the capitol. In line with our mission and in the absence of an appropriation from the general assembly, MSCC continues its history of fundraising to assure the restoration and preservation of the capitol. 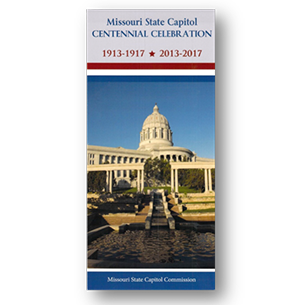 Over the past decade, MSCC commissioned and successfully raised a subvention to offset publishing costs of the first comprehensive book on Missouri’s capitol, and is currently working to fund a comprehensive assessment of the building’s interior art.